Simon is our Elf on the Shelf. And the kids aren't the only ones who love him. In December, the kids wake me up and my first thought is 'OH SHOOT-I didn't move the Elf' and I distract them while I go to move him. But some mornings, ok most mornings, Simon isn't where he was left the night before. And at that moment, I call M out to find him and I actually can't help her. In fact, I totally get into the hunt and get excited to find him. Some parents go all out. They have Elves who get into trouble, or pull of crazy stunts. Some have admittedly lazy Elves who hang out in the same spot for a few days at a time. In our house, the magic is real. This mama doesn't move Simon. We wake up and we all try to find Simon. It's great fun. And it's all real. 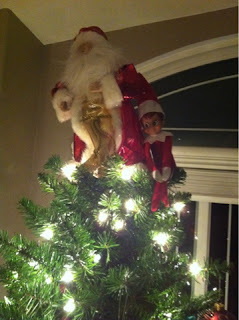 Today, Simon wanted to hang out with our Santa, and M found him on top of our tree. Do you have an Elf? What is your Elf's name? And what's his or her favorite place to hang out?